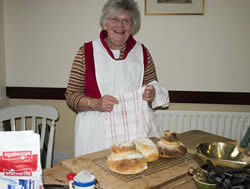 The History Group Open Day on 4th October was based on the theme of cottages and cottage crafts. The displays put together by the History Group included a large collection of old photographs showing cottages in the village (most of which are still standing today although not all easily recognisable from the photographs). Each was accompanied by a short piece of printed information describing some of the more interesting features of the buildings. The traditional craft of rag rug making was featured with a part completed rug on display by Freda Proudley and 2 further rugs included in other displays. Visitors were invited to try their hand at this once popular craft. Also on display was an authentic spinning wheel loaned by John Brittain. 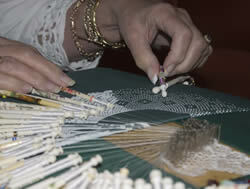 Mrs Janet Sutton had a working lace-making exhibition with some outstanding examples of her work. Mrs Sutton not only makes lace but lectures lace-making at university and was happy to impart her knowledge of lace-making and history of the craft. Of the over a thousand lace bobbins she has collected over the years she had on show a small proportion, each with its own piece of history. In the ‘reading corner’ were the Peter Mason’s files and also a Microfiche machine with Beckingham and Saundby Parish Registers available for the group to view. Albert Philipson ran a rolling slideshow of many of the village cottages and other photographs including the recent Village Hall 60th celebrations and a video made of the day. The web team had a display of web pages in keeping with the theme of the day and also a file with copies of each page (which now run to over 150). A further display held a number of period implements, utensils and gadgets including a butter maker, dolly tub, several old packets and tins of purchases that were popular during their day such as Fynnon Salts, Camp coffee, Zubes throat pastilles etc. There were also various earthenware jugs, jelly moulds, pots, bowls, books, a copper kettle, a bed warmer etc. 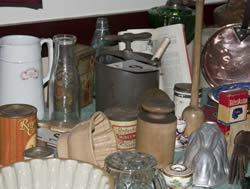 Included in amongst all this ‘paraphenalia’ were 20 ‘mystery’ items that visitors were invited to name via a quiz. Of course not everyone was willing to admit they were old enough to recognise what the items were! If the displays and quiz did not attract visitors then the authentic kitchen corner with its appetising aroma certainly did. Caroline Thomas worked very hard all day baking in the traditional way, producing an apple tart (using fine local fruit) cooking a meat pie (previously prepared) and baking cottage and tin loaves. Spilsby. Linda is the daughter of Jack Taylor, the airman killed in the Second World War, and whose tragic death (along with his Lancaster crew members) was commemorated in Bois D’Arcy, France in 2007. Click here for a link to the web page for more details. As usual coffee, tea and cakes/scones etc were served throughout the day and finally the bread Caroline had baked was auctioned off for charity. 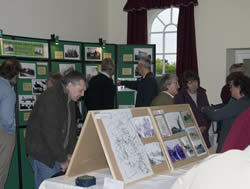 In total £130.00 was raised that included money from the auction and donations which went to the Group’s funds.